My favorite of them all is the Derek's Anna Banana Song. This best shows family-sized connection and sharing at home. For me having a high-speed connection is a must these days. Work, Play, Socializing, Planning for the weekend, you'll be needing "IT". How hard it can be cancelling or missing an appointment jsut because you aren't connected to the net? This commercial really represents the importance of not only having an internet connection, but also having a fast and reliable connection for the whole family right at the comfort of our home. Before, we have to switch turns for us to enjoy our internet, but now, thanks to PLDT myDSL we can be connected all the time, no matter where we are at our own home. How cool is that? Check this awesome "cool-mercials"(I own this word, haha!) 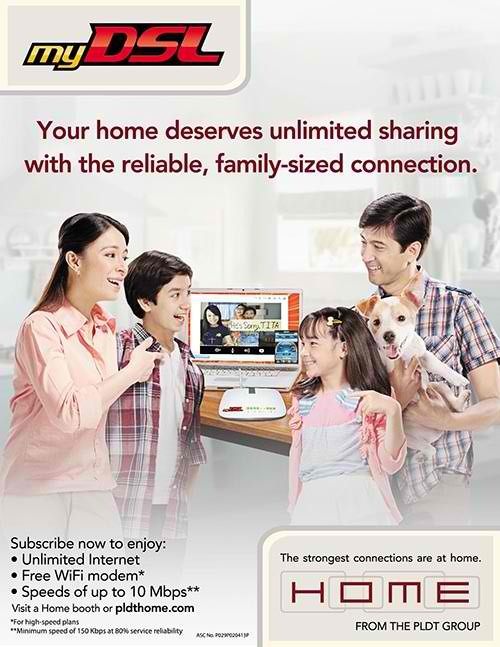 showcasing how the internet and PLDT myDSL helps the family stay together and support each other. PLDT myDSL, get it now!